You’re trying to sleep when a toothache strikes. Or your child crashes their bike and chips a tooth. Maybe you’ve noticed a dull, throbbing tooth pain that just won’t go away. A dental emergency strikes most of us at some time in our lives. Not knowing what to do or where to go for relief can make the situation worse. Moreover, tooth pain prevents us from being able to concentrate on other activities and enjoy life fully. That’s why at Munroe Falls Family Dentistry, we welcome emergency calls — even from non-patients — to help you make a plan for relief. If the office is closed, listen to the recording and follow the instructions to leave a message. A member of our dental team will respond as soon as possible. Sometimes, you simply cannot wait to see a dentist. Below, we’ve listed some common examples of mouth injuries that require a call to an emergency dentist right away. Pick up the tooth by the crown (the white part), and not the roots or bottom of the tooth. If the tooth is dirty, gently rinse it under cool water (no more than 10 seconds). Once it’s rinsed, gently place and hold it in its socket if you can while you get to the dentist. If it’s too painful to place in the socket, put it in milk until you get to the dentist. Get to a dentist within 30 minutes if possible. The longer it takes to properly clean your socket, the tooth, and re-implant it, the less chance you have of saving the tooth. An abscessed tooth can cause great pain, and it can become dangerous if not treated. A tooth abscess involves a pocket of pus that develops as the result of a bacterial infection. If not treated, this bacteria can dangerously spread to your jaw, neck, or brain. Thus, if you suspect you have an abscessed tooth, call our dentists right away. If you delay treatment, you risk much more than simply losing the tooth. Do NOT try to force the tooth back in place. If you can move the tooth into place with light pressure, do so. Try to gently bite down to keep the tooth in place. Keep any broken pieced if you find them and place them in milk. Take them with you to the dentist. If desired, rinse your mouth gently with salt water. Place a cold compress to the facial area if you have any swelling. Use a topical pain reliever like Orajel if you wish. Continue eating and drinking soft foods if it’s not too painful to do so. Call your dentist to discuss your situation. Sometimes, you will not know what your true dental situation is. All you will know is that you’re in pain! Call our office, so we can start to help you determine the source of the pain. Even if the cause turns out not to be a “true” emergency, your pain deserves to be addressed! In addition, your worry deserves to be calmed. 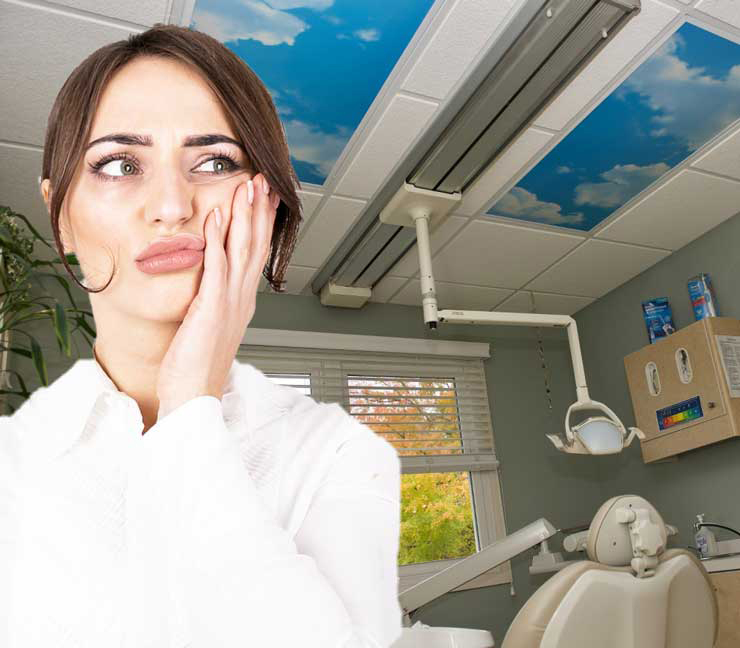 Other dental incidents, though uncomfortable or unsightly, do not have the same urgency as the ones discussed above. You can generally monitor these situations at home until the dental office opens. Unlike a broken tooth, a chipped tooth is more superficial. It does not involve deeper layers of the tooth. Rather, a chipped tooth means the outer layer of your tooth has chipped. A chipped tooth, unlike a broken tooth, rarely causes pain, but can be unsightly. You should call your dentist when the office is open to get an appointment quickly. Avoid eating hard, crunchy, and sticky foods. Apply clove oil or Orajel to the sensitive area with a cotton swab for pain relief. If you lost a filling, you can buy tooth “cement” at most pharmacies and place some on the spot where the filling was. If you still have the crown, you can wash the crown and put it back in place with a tooth “cement” you can find at most pharmacies. Or you can use denture adhesive or petroleum jelly to hold it into place. NOTE: These fixes are very temporary and do NOT replace the need to visit your dentist to have the crown properly secured or a new filling placed! We understand that broken dentures can greatly disrupt your life. Make sure you save all of the pieces. Also, no matter how tempted you may be, do NOT try to fix your dentures or partial using superglue! Instead, call your dentist immediately and explain the situation. Keep all of the broken parts in a safe container to take with you. Of course, the first step is to call your dentist when a toothache strikes! But how can you relieve toothache pain at home while you wait for a dental appointment? Take pain relievers as directed. Either acetaminophen or ibuprofen is best. Take them as directed on the bottle. Rinse your mouth with warm salt water. Mix 1 tsp. of salt in 8 oz. of warm water. Gently swish and spit. Use a cold compress. Place an ice pack (covered with a towel or T-shirt) to the outside of your mouth where you feel a toothache. Apply clove oil or Orajel to the sore tooth. Clove oil is found in sedative fillings because of its soothing properties. Rinse with an OTC product like Peroxyl. This helps to clean the problem area and can help soothe the sore tissues. Any of these methods may give you temporary relief. Don’t rely on these home remedies to cure your toothache, though! None of them address the real cause of a toothache. Only your dentist can fully asses and treat the cause of your toothache! Not Sure What is the Cause of Your Tooth Pain? Because the causes are many, you need a dentist to evaluate the cause of your dental pain. Left untreated, toothaches can get worse. Also, the longer it’s left untreated, the more extensive intervention you may need. Early intervention is your best approach! If it’s after hours, please leave a message. Be sure to speak clearly and slowly, so we know whom to call back and at what number. We will make every reasonable effort to return messages that require prompt attention as quickly as possible. We’ll listen to your concerns carefully to best help address your situation quickly and compassionately. If we can’t help you, we’ll point you in the right direction as best we can. Who can reach us quickly for dental emergencies? Stow, Ohio 44224: Our address is officially 425 North Main Street, Munroe Falls, but we’re right on the border of Stow. Indeed, we’re only 0.6 miles outside of Stow1 Stow residents know North Main Street as Route 91. We’re south of the Stow-Munroe Falls Library, just after the Adel Durbin Park. You’ll see us on your right-hand side. Tallmadge, Ohio: We’re only 3 miles south of Tallmadge. Take 91 North from Tallmadge to get to us. In Munroe Falls, Route 91 will turn into North Main Street. We’ll be on your left-hand side. Cuyahoga Falls, Ohio: You’ll find our office just 3.1 miles east of Cuyahoga Falls! We are also close to Hudson, Ravenna, and Akron. *This blog is not intended to serve as medical advice. It is for informational purposes only. If you’re experiencing a toothache, please see a dentist.